On the rainy/misty day, we continued driving along Highway 30, past a bunch of waterfalls, including Multnomah Falls, stopping in a lot of places to get our and explore, and drove all the way to the town of Hood River. From there, we turned south, did a bit of the Fruit Loop drive and then drove on 35S and 26W to Timberline Lodge to see Mt. Hood and then back to Portland. Did I mention it was a misty/rainy day? And the lodge is up a mountain? As we drove up and around and along the twisty roads, the rain became heavier, and then it changed to snow. By the time we got to the lodge, it was 36 degrees, windy, and snowing. There was no visibility. Here is our view of Mt. Hood. I think. Who knows if we were even looking in the correct direction?! Even though the entire drive we did is a loop, it takes a lot longer to drive from Mt. Hood to Portland than from the gorge/waterfalls areas to Portland. Since it's such a long drive, we didn't try to get back to Timberline Lodge on the sunny day. 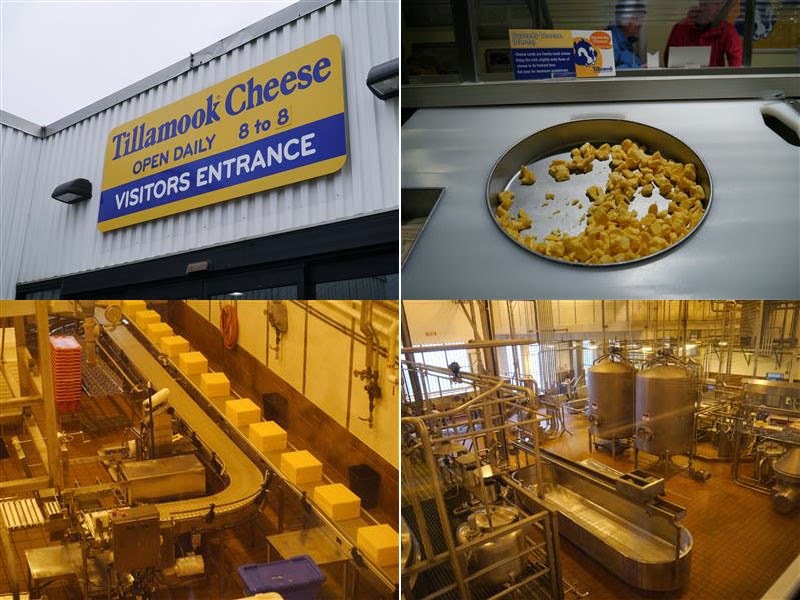 We drove through the Tillamook Forest (6W) to Tillamook, home of Tillamook Cheese Factory. There's a free, self-guided tour of the factory, cheese samples (yes, please! ), an ice cream counter, and lots of cheese goodies to purchase. And fudge - we got salted caramel fudge and triple chocolate fudge. But back to the cheese! Giant vats of cheese! Giant blocks of cheese! Lots of sample cheese: squeaky curds (I love squeaky curds! ), cheddar, extra sharp cheddar, jack, pepper jack, and a very spicy jack. Yum! After the cheese, we did the Three Capes Scenic Drive from Tillamook to Pacific City. Honestly, it wasn't too scenic. We missed the first cape - I think I read the north part of the drive is closed so maybe that's why we didn't see any signs for it. Cape Lookout had a nice paved path to a viewpoint of the ocean, but it was pouring rain, so we just kept driving. I'm not clear on what happened next except that the road the GPS was telling us to take from Pacific City towards Dundee was closed, so we had to backtrack and re-route and thank goodness for GPS. We drove through wine country, admiring the scenery and vineyards, and ended up in Dundee where we browsed through some shops, ate a delicious meal, and found an Ace Hardware to fix my wheelchair leg, which had somehow come apart in the trunk of the car and we lost the nut that holds the bolt connecting the footrest and leg. I was really looking forward to the OR coast part of our trip, but of course the weather was not cooperating. The day that we drove to Astoria, it was cold and gray and drizzly. Astoria is very cute. We got there in time to grab some lunch on Pier 39 then drove up to see Astoria Column and got some great views of the town and water. I didn't last long wandering around because the cold and wind made me way too cold. I was wearing a scarf & earmuffs! Next we headed south on 101 to Seaside. Seaside is a cute town. Lots of shops, lots of food (elephant ears, taffy, ice cream, fudge), a boardwalk - I would have loved to have more time there to explore, and more time in Astoria. We got to walk along the ocean in Seaside and we sat for a while, just gazing at the vast expanse of water and the waves, until the cold breeze made me start to freeze! Around 4 pm, we again headed south on 101, down to Tillamook, and then drove back to Portland through the Tillamook Forest - so 2 drives through the forest with no cell reception! We stopped at a few scenic viewpoints along the way and finally got back to Portland around 7 pm. This was perhaps the day trip that interested me the least, but in the end, I think I enjoyed it the most, perhaps because we finally had some sunshine! I was 9 years old when Mt. 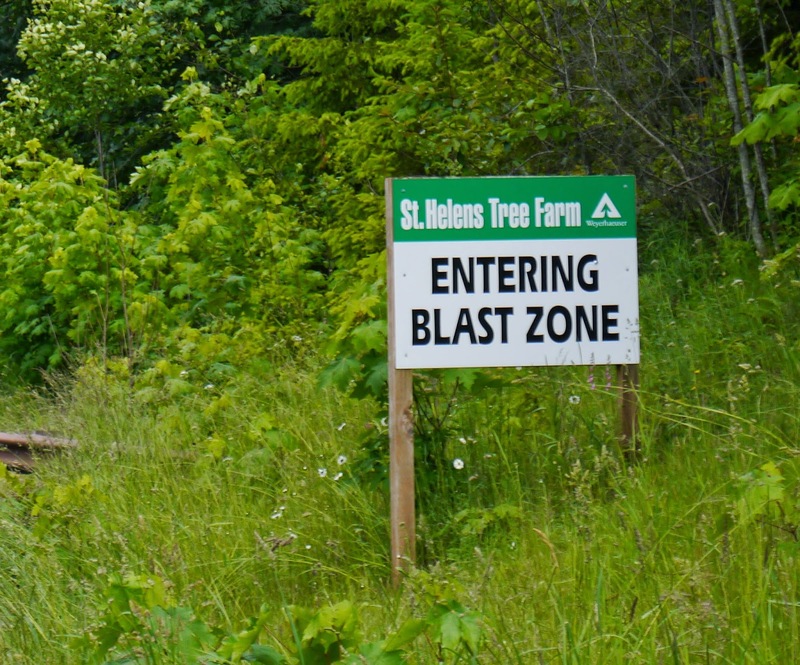 St. Helens erupted, and I remember watching the news about it. It is impressive to visit and to go through the visitor centers and read/see the exhibits about the eruption. It is impressive to see photos of the eruption aftermath and then drive through the park and see how the landscape has changed in the 34 years since the eruption. Definitely worth a trip. Since we lost a vacation day due to being rear-ended, we had been considering dropping this trip because we figured we could always drive down from Seattle when we take our vacation there (not yet planned, just on the vacation list) but it's actually closer to Portland than Seattle even though it's in WA. All that green growth and the tall trees and the forests you drive through? All since the blast. I definitely could have used more time in Seaside & Astoria as well as a little more time in wine country. It would have been nice to visit a winery and sample some wines, but we ran out of time (most seem to close by 5 pm) plus neither of us can drink much right now (medications) so we pushed the wine part of the trip to a lower priority. Also, I'd like to see Mt Hood from Timberline or Copper Spur on a sunny day. On a future trip, I'd like to go a bit more south along the coast, down to Newport and then down to Florence and the sand dunes - there just wasn't time on this trip. But these day trips - in spite of the wind, the cold, the clouds, the rain, they were all fantastic!